We've created this web site to share some of the stories, the history and activities - both past and present - that make Bickleigh Vale village a unique and special place. It started with Edna Walling's vision back in the 1920s when she started building the original properties and creating the landscape and gardens that live on today in the place Edna named, "Bickleigh Vale." Edna's legacy lives on in The Place, The Heritage and The Community that is Bickleigh Vale village today. Our About Us page will tell you more. If you visit us to stroll along the lanes, you can park your car in Pembroke Road but there is one thing we ask - please respect the privacy of the residents - THERE IS NO PUBLIC ACCESS TO THE GARDENS. If you'd like to get in touch with us, email us though our "Contact Us page"
Our Quick Find Index will show you at a glance what we have on our website and take you straight to the topic you are interested in. Occasionally, some of the Bickleigh Vale gardens are open to the public, or to private tour groups. 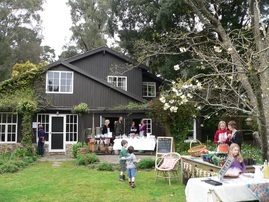 We last participated in a large open garden day with the now-dissolved Open Gardens Australia in 2014. Eight of Bickleigh Vale’s private gardens were open to the public. We are currently planning with Open Gardens Victoria the opening of the village again on Sunday 13th October 2019. From time to time we have requests by individuals or tour groups for garden visits but we're not accepting these for the time being. We love to share our beautiful village as much as we can but you'll understand that balancing work, family and other commitments takes time too. Or join our Facebook group if you would like to be notified of the next public garden opening for individuals, small groups or for further details of our Open Garden day with Open Gardens Victoria. Bickleigh Vale was given heritage protection in 2004. Maintaining the gardens at Bickleigh Vale can sometimes feel like you are on an archeological dig. Stone paths can suddenly appear from beneath the growth (take a look at Whistlewood's blog for their latest discovery). 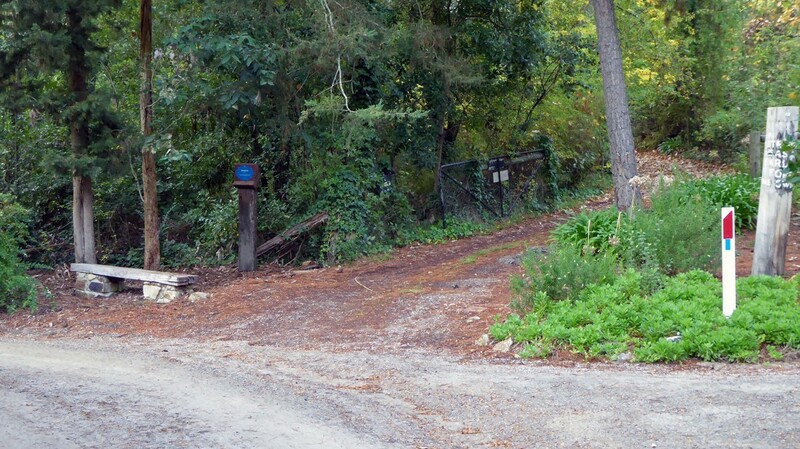 ​Then there are the trees, structures or events around which the current residents are not aware of why they exist, who put them there or when. The history has been lost. 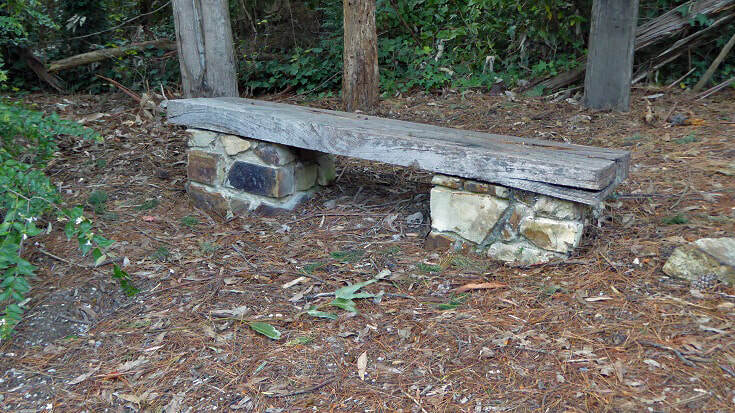 ​For example, every day we walk past a seat and an old telegraph pole. No-one knew who installed the seat or why the telegraph pole remained after the power and telecom lines were placed under-ground. That was until we were provided with some minutes and correspondence from a resident's meeting in early 1990. ​The seat was installed by the Victoria's Garden Scheme in 1991 to commemorate the under-grounding of power and telephone services in 1990. It was meant to have a bronze plaque attached so future generations would know why it was placed there, however, it was removed after a spelling mistake was discovered and never replaced. The pole was left behind by Telecom after completion of the project. The residents at the time discussed raising it with Telecom, however, it was noted that, due to an 'invoicing problem', the Garden Scheme had never been invoiced by Telecom for their portion of the costs associated with the project - a sizeable sum in 1990. So they kept quiet! But, why the words 'Beauty in Australia is like pearls before the swine' has been painted on what is left of the pole remains a mystery. Do you have photos, a story, video or other material about the village? If you or your relatives have lived at Bickleigh Vale or spent time here, we would love to hear from you. Please contact us to be a part of capturing the history of this wonderful village for future generations. 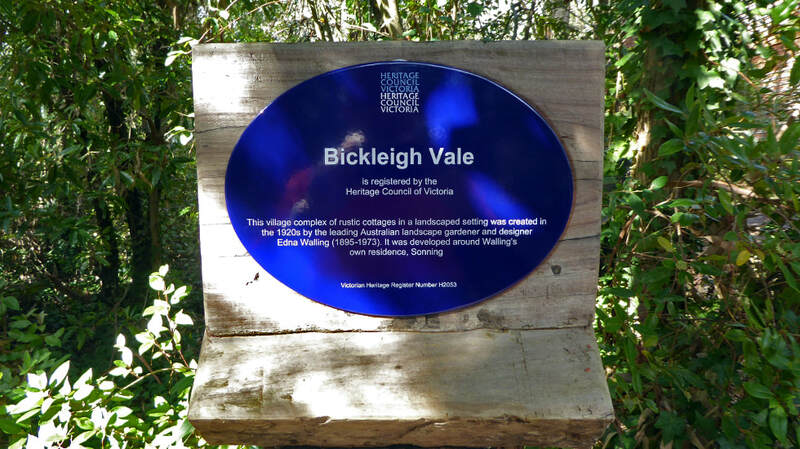 Recognised by The National Trust and declared a “Classified” Landscape, Bickleigh Vale is also recognised as “an area of special significance” by the Yarra Ranges Shire. 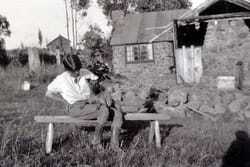 In the 1920’s, still in her mid-twenties, one of Australia’s first landscape designers, the English born Edna Walling, created a village in the ‘English style’ of approximately 12 ha around her own residence ‘Sonning’. Prospective owners were required to agree to Edna Walling’s involvement in the design of their cottages and gardens, with all plants supplied from her nursery at ‘Sonning’. Today, more than 80 years later, Edna's vision continues to be realised through a community of like-minded people. When Edna Walling left Bickleigh Vale in 1967 and moved to Buderim, Queensland, property owners – now ‘Friends of Edna Walling’ – became caretakers of the village, including its roadside verges.